I made some more changes and resubmitted the whole thing, some customizations using the box style of category will have to edit a few lines of CSS, but the structure/organization of category styles is much better. Is there a way to isolate the code that make the category bars coloured? I just updated my theme to allow for the structure changes made when we added the bullet category style, it also made CSS smaller. Cool. I’ll take a look and see if any of it will fit with my work. I had already done quite a bit of changes, so I’m thinking we need to figure out the future of custom themes and how they can be consumed/managed. How much interest is there in supporting something in core for this, including a way to keep them up to date? It could work as a plugin now that most of the plugin hooks exist to create it. Question; is it possible to bring back in minimal theme heatmap colors for posts and add column views? If you have a look in Discourse and find the templates that are being overridden, eg data-template-name=‘list/ topic_list_item.raw’ then you can see what the original templates look like. Then you can find any parts that are missing and merge them back into the Sam’s UI template overrides. When username ‘too long’, it becomes like on the picture. Any workaround for this? This will force no line-breaks, so the long name will simply overflow past the container’s right edge. which will apend “…” to any overflowing text instead of wrapping it to the next line. See here. I find that too many colors distract me in the theme, but highlighting the hottest conversations does have some benefit. Have you updated your code with this? I was looking into this the other day but got side tracked since it wasn’t working as expected. 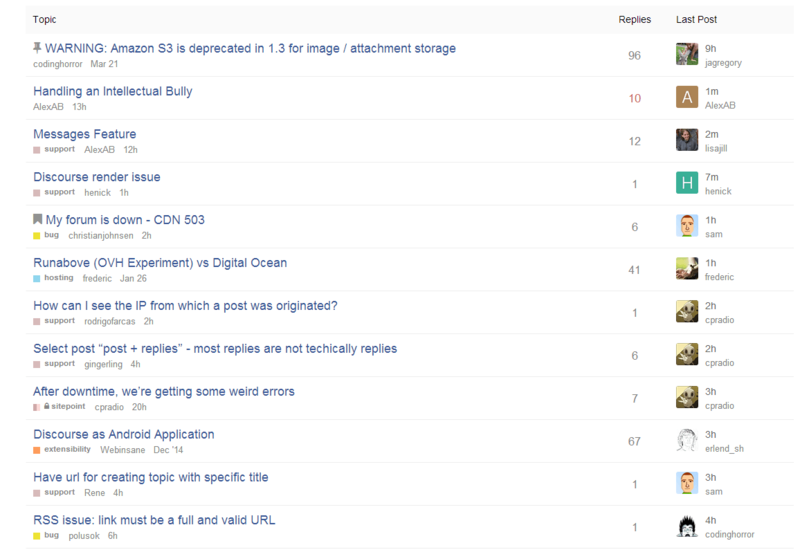 @eviltrout my theme is pretty broken now, I think the list item template override is not longer taking, how do I fix? Ah that could be because I changed it to the preferred ember style of using dashes instead of underscores. So topic-list-item should fix it. Interestingly, I just upgraded to latest and my override didn’t break. Though I am having issues with the suggested topics showing user info sometimes and I am not sure why. I think it might have to do with the model/data store changes? this would be a great addition! did anyone try to do something like adding excerpts?